A few years ago when the Dow Jones Industrial Average was at 6500, it was insane to even talk about Dow 20000. Predictions of Dow going above 10,000 was received with skepticism. Talking about 20,000 was thought of just "attention grabbing" for newspapers. Fast forward 8 years later, the Dow Jones not only breach the 20,000 mark. As of December 2017, the Dow is in danger of breaking above 25000! If the Dow can almost quadruple in less than 10 years, it will not seem far fetched to say that it will double from 25,000 to 50,000. Call it crazy or insane, but history is on the side of the Dow and all facts do point to the possibility of the Dow going north of 50000, 75000 or even 100,000. It's just a matter of time. Here are the shocking reasons why the most famous index in the world will always have an upward bias. 1. Because Warren Buffett Says It Can Go To 1 Million! When it comes to investing advice, you can't get any better than the "Oracle Of Omaha". ""Being short America has been a loser's game. I predict to you it will continue to be a loser's game,"
Forget about arguing with the greatest investor on earth. Unless you have a better track record then Buffett, its best to have faith in America and the Dow Jones Industrial Average. What if I told you that the way the Dow Jones is structured will always benefit the bulls? Of the original 12 components that make up the Dow Jones Industrial Average in 1896, only General Electric remains in the index. Apple was added in 2015 to reflect the new economy. The owners of the index keeps deleting bad companies and adds new companies to this index. And boy oh boy, they are smart to add only the best and greatest money making companies to this index. Do you see why Dow Jones have an upward bias now? It's like an exclusive club where they only let millionaires in. Every year they revise the requirements. Bring in richer guys and kick out the poorer ones. In 10 years time, only those who have a net worth of $50 million and above is on the membership list. By 20 years time, only those who have $500 million in their account gets to be in the club. I think you get the idea of how smart the guardians of the Dow Jones Index are now. And here's a secret, the S&P 500 also follows the same formula. Which is why every few years, you see some bad apples being thrown out of the S&P 500 and new shiny good apples being brought in. In other words, the S&P 500 index is also bullish bias in the long run. We don't actually have a detailed break down of how much the companies in Dow Jones earn from inside and outside of US. But one undeniable fact is that 50% (or even more) of most listed mega companies in US get their dough from outside of America. Which explains why, popular brands have branches all over the world. Go to any big city in any country and you can see those brands springing up like mushrooms all over the place. You just need to think of McDonalds and Apple. If most companies get more than 50% of their earnings from outside US, there is still a lot of untapped potential from emerging economies. An old school thought that once permeates in the minds of ancient selfish nations is "If its great for you, then its bad for me". In today's modern world entwined by fast internet, the border less world has changed the rules of business. If another country has a growing economy and emerging middle class, it could only mean more profits for US companies. Today, millions upon millions of Chinese people are holding an iPhone in their right hand and an iPad on their left hand. At home, they have a Mac Book sitting at their shiny desk. And their kids are yelling to get an iPhone X or whatever latest model that has another spec bump up. More profits mean an upward revision of stock prices for Dow components. Which in the end will result in a higher Dow. 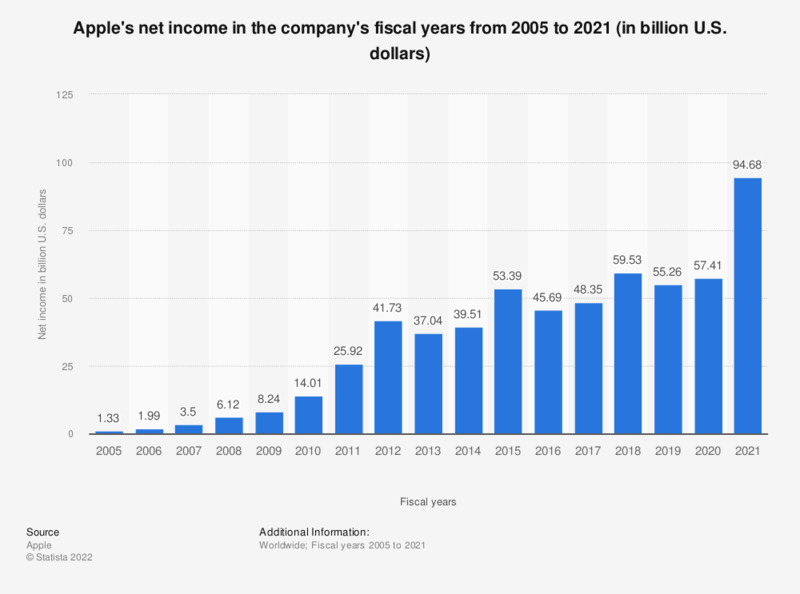 The above is the net income of Apple over the years. Thanks to a growing middle class around the world, Apple's income has increased tremendously. And so is its stock price! 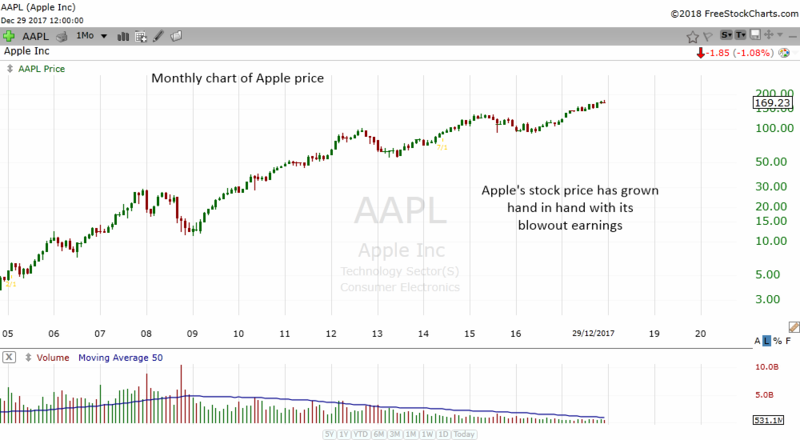 Check out the stock price of Apple below, do you see a correlation between increasing income and stock price? 5. Inflation ! Inflation ! Inflation ! Its no secret that the stock market is one of the best hedges against inflation. Putting money in the bank and earning interest might preserve your capital (a bit) against the corroding effects of inflation. I used to be able to buy a bowl of noodles for $4.00. Today it might cost me $11.00 per bowl. That is the effect of inflation. It kills your savings. It makes your purchasing power goes smaller. 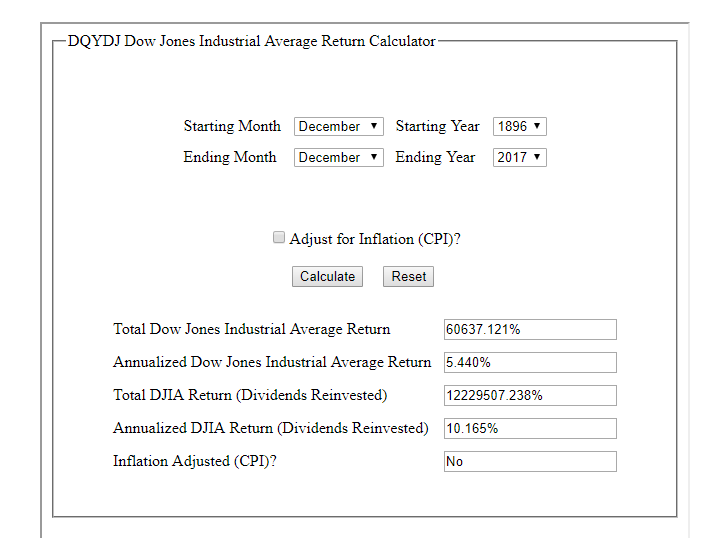 I went to the Dow Jones Industrial Average Return Calculator and got this snapshot. The annualized DJIA Return with dividends reinvested is 10.165%. The average inflation rate over the long term is about 2-3% per annum. With such returns from the Dow Jones, it is easy to see why over a long period of time the stock market is still one of the best hedges against inflation. It's just too bad that only the elite and richer families are heavily invested in Dow and S&P stocks. This explains why the rich keeps getting richer and the poor gets poorer. The reason is the rich has a big hedge (that keeps growing) around their house that protects them from the swinging axe of inflation. One of the most famous maxims in Wall Street is "The Trend Is Your Friend". What this means is if the trend is up, it will likely to continue to go up. Take a look at the yearly chart of the Dow Jones Industrial Average. 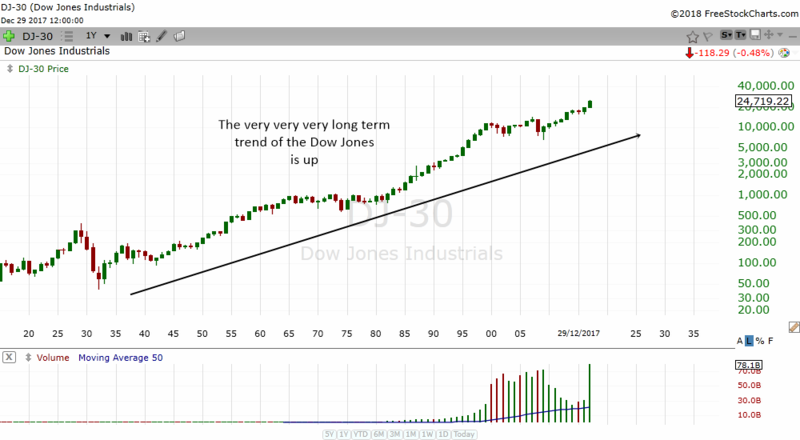 The very very very long term trend of the Dow is up. Even a 7 year old kid will be able to tell you that the chart moves from lower left to upper right. You will do very well to buy stocks like these (in a daily chart). Most people just seem to like to buy stocks going the other way. If the long term trend is up, it makes sense to believe in Buffett when he says be bullish on America. We had the most unpopular President who just happen to be a businessman. What do businessman like? Pay less taxes. Trump wants to cut taxes for corporate America from 35% to 20%. Can you imagine the insane amount of money that companies get to keep? Though the tax cut by Trump will add anywhere from $1 Trillion to $1.5 Trillion to the US deficit, it will also add $2 in earnings per share for every 1% of tax cut. "It always seem impossible until its done". Will Dow Jones Industrial Average go to 50000? It most probably will. Whether it will be in 2018 or by 2020 or 2030 no one knows. But it is very likely to reach that milestone in the future. If you think this is impossible, just remember that the Dow was at 81 a century ago.